This is a traditional summer event for the Fukuji Onsen Area. During the event period, there are nightly performances of the Henbetori lion dance, which has been designated as an intangible cultural heritage of the town. This dance is said to have originated with the Emperor Murakami, who once visited this place to rest from his journey and, seeing the villagers troubled by a plague of snakes, performed a dance in supplication to the gods to drive the snakes away. The festival also includes performances of the traditional Torigei dance, passed down through generations, and the holding of the Ema Market and evening stalls. When Takeda Shingen of the Kai Province invaded Hida with his army, he became incapacitated from fatigue and the noxious vapors from Mt. Iodake. Just then there appeared a white monkey that led him to the hot springs. 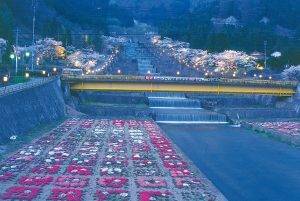 Bathing in the hot springs restored Takeda’s vitality. 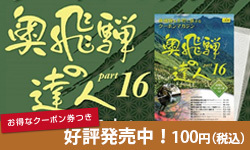 This is the legend of the Hirayu Onsen hot springs. The Enman festival is held in celebration of this legend, with a white monkey as its mascot. The Ideyu festival is a traditional summer event held on the grounds of the Shinmei shrine of the Shin-hirayu Onsen Area. Each night there is a performance of the traditional Torigei dance, which has been designated as an important intangible folk-culture property of Gifu Prefecture. Torigei is a tradition said to have been passed down through generations from the legendary fugitive Heike warriors who once lived here. Wearing headdresses made of rooster feathers known as shagama and robes patterned with dragons and peacock feathers known as katabira, the performers dance to drums and flutes while beating hand gongs. There are also demonstrations of other local performing arts –the lion dance and the Takara-taiko drums– and the holding of the magnificent Ema Market of votive plaques (ema) and evening stalls.